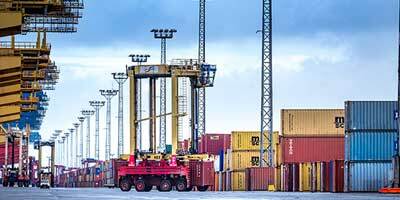 As the fourth-largest container hub in Europe, the terminal now has a total of 14 berths for mega container vessels. These ships are meanwhile up to 400 metres long and up to 60 metres wide and have a carrying capacity of around 20,000 standard containers (TEU). After a total of six expansion phases, the impressive quay has grown to an overall length of almost five kilometres. More than 40 container cranes can each load or unload up to 40 containers per hour. In 2016, the terminal recorded a throughput of more than 5.5 million TEU. Bremerhaven is one of the leading container hubs: like a sponge, the port absorbs freight from all over the world and simultaneously distributes vast quantities of goods to destinations throughout Europe and overseas. To handle the transport of European import and export consignments, the terminal uses a close-meshed network of efficient rail and road hinterland connections. The global port on the River Weser is also used by a large number of feeders, seagoing vessels which link Bremerhaven with numerous other European ports. The success story of these steel crates began in February 1968. The storage and transport of different types of goods was greatly facilitated by the use of standardised large transport crates. Containers revolutionised shipping as well as the entire logistics industry, paving the way for globalisation. The ports of Bremen were convinced of the potential of these innovative containers from the word go: in 1966, the very first container ever to be unloaded at a German port arrived at Bremen’s Überseehafen. The growing importance of containers radically changed maritime logistics, as suitable ports and transhipment terminals were needed to handle the increasingly large freight vessels. Bremer Lagerhaus-Gesellschaft, later to become BLG Logistics, was one of the pioneers and shifted the container business from Bremen to Bremerhaven, where the first berth at Stromkaje, the riverside quay at the Container Terminal, went into operation in 1971. The success story of Bremerhaven Container Terminal began in February 1968 when construction work began on a 700-metre long quay.